As game executive Bing Gordon famously put it (about) in 2010, "This is the most promiscuous app audience in the history of mankind." This is the (heavily delayed) diary of a (brand new) promiscuous gamer... who now has a YouTube channel. This lies dormant on my tablet. Mainly because I'm still testing my theory that the idle collection has a cap. I have returned this game after nearly two weeks of not playing, and still have the same amount of money available as if I had only gone back after a day. I'm sure of it. Oh well. It's not enough to make me get rid of the game, so it remains. 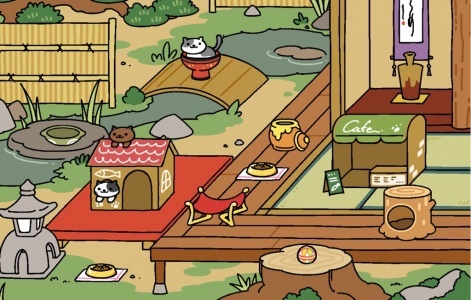 A new update has come out, meaning there's new cats to collect, and my better half has deleted the game from her phone, so now I'm officially better than her at Neko Atsume. This shouldn't make me as happy as it is doing, but there you have it. All that said, I can't seem to catch a glimpse of the little buggers, so I'm still way off snapping pictures of every cat. Might have to get serious about completing my collection. Strangely for me, I've actually started to settle into a routine of loading this game up once a day and completing all the dailies. I've cleared rank 50, just as an update rolled in to up the cap to 80, and have returned my focus purely to the meta-game. I just love getting that XP, you know? I don't even want to know what's happening with Micah right now. I haven't touched this game in a long time. But I guess I'll go have a look. Just a minute. OK I'm back, and I'm deeply unhappy with my life choices. Here's a video on why. Three months into my Tap My Katamari experience and I am destroying it. Tearing it up. Whatever it is the kids say these days. Maybe I'm reem? I have no idea. What I am certain about is that I'm still enjoying this, somehow, despite any initial misgivings I may have had. Though, as is often the case with clickers, I still don't know what the point is. Did you know I presented the Vainglory Winter Championship EU Finals? It's true! I still have the hoodie and I wear it every day like some corporate sellout. Mainly because it's really comfortable. I don't play Vainglory much anymore though. Super Evil very kindly unlocked all the characters for me (#Ethics) and I had a bash at Ranked matches, which kind of drove me away. As noted on AppSpy, I am not a good player. And the others in Ranked matches know this, and abuse me accordingly. So I think I may just have to slink away into the night on this one. Haven't gone back to this much recently. Had a good run of it at towards the end of March, but my desire to return has eased off greatly. Not because it's a bad game, of course. I still think it's wonderful. But the draw is no longer there. Sorry, Kendall & Kylie, it's not you, it's me. Sometimes I play this on trains, and in my head I have this little narrative running where someone sat behind me is watching me and thinking, wow, that guy is really good at Alto's Adventure. Not been making any real progress here, but I still go back to it every now and then. It remains one of my favourite games of all time. I was doing OK at Clash Royale for a bit, and then I started being terrible, and now I just don't play it enough for it to be worthwhile mentioning. Can't knock it as a game, though. It's a very enjoyable experience, even when you're being absolutely decimated by the opposition. This hasn't been deleted… yet. This one is a case of "I simply don't have the time" rather than "I don't want to play this anymore." That and my iPad Mini isn't quite up to scratch enough to play it. I did not expect to still be playing this, but here we are. Perhaps the draw of daily rewards really has sucked me in for once. It has the same kind of feel as Galaxy of Heroes, except with a lot more depth and strategy involved, which ordinarily I would run screaming from, but here is actually quite enjoyable. Not that I have even the faintest idea what's going on, or who half these people are. What's a Moon Knight when it's at home? Who cares, he hits hard and soaks up all my damage. Score! I got a little bit into the original Crossy Road when I first started playing it. The Disney version? Not quite as much. It's an enjoyable game, still, and nothing really has changed. But having all these Disney characters causes it to lose some of its original charm, I guess. Plus it's a callous reminder of how bad I am at Crossy Road. Because I have a propensity for downloading trashy games and playing them for all of five minutes, I got recommended this trashy game that I expected to play for all of five minutes. Instead I'm now sinking so much time into it that it has ceased to be funny. It's an idle game where you play a man trying to not have to get a job, and so earns money by being given an allowance from his rich girlfriend, which increases every time he does a nice thing. The most recent nice thing has been to clone himself 10 billion times, which seems excessive to say the least. I think the less we say about this one the better. Look, I barely even cook for myself, let alone other people. I've never been good at puzzle games. Not my scene. But the kids like it, so fair play to them. A game that left my tablet almost as soon as it arrived. Not a bad game by any stretch of the imagine, but far too deep and involved for my tiny attention span. 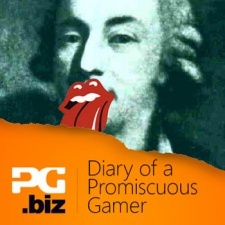 Keep up with what the Promiscuous Gamer is playing by subscribing to his YouTube channel.